The Atlanta Symphony Orchestra, known as the ASO by locals, may not be your typical tourist destination, but if one has an interest in music, the Atlanta Symphony Orchestra is well worth the time to hear. And, top hats and coat tails are not required…the dress code is "comfortable." 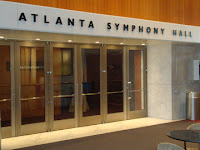 I'd been looking forward to attending the ASO since returning to Atlanta. When I saw half-off tickets being offered through Groupon, the deal was on. No, it's not at all gauche to attend the Symphony on a discount ticket. As a matter of fact, I was able to get tickets in the best acoustical section in the theatre. As Groupon often does for performances, they offered a selection from which to choose. Being a Beethoven fan, I opted for Beethoven/Mahler concert. Now then, what to wear? I've discovered that the Symphony experience varies from city to city. The Atlanta Symphony Orchestra's website addresses appropriate couture for their performances and they, kindly, insist on being comfortable. There is actually no official dress code however they do forewarn that most attendees will arrive in business or business casual attire, as was the case when I recently attended. I personally find that dressing up adds to the "experience." Wicked Divas - featuring music from the Broadway hit "Wicked"
I attended an ASO concert many years ago when Dudley Moore was the guest pianist. Dudley appeared for the last song of the first half and he was actually quite horrible. I thought to myself, "I'm using two hours of my life for this?" Following intermission, Mr. Moore was brilliant! He really was an incredible musician. I quickly attributed his first-half performance as a comical nod to the movie "Arthur." It turned out to be a highly entertaining evening and the music was goose-bump-inducing phenomenal. As I write about the evening's performance, I understand what Jodie Foster meant in the movie "Contact" (watch at mark 2:40) when she was trying to describe a celestial event: "…they should have sent a poet." The ASO's music is truly beautiful. It transports you to another time, another place, another life…song after song. 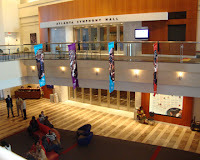 I can't say it enough, "The Atlanta Symphony Orchestra is an experience." Logistically, the ASO is easy to attend. It's located in the Woodruff Arts Center on Peachtree Street in the heart of Midtown. There are numerous dining options, parking options and other sights to see nearby. It shares a modern, two-story atrium with the Alliance Stage. 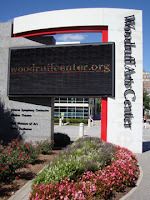 If you're picking up tickets at the box office, it's located near the Woodruff Arts Center's Peachtree Street entrance. I usually use the side entrance near the marquee, which is also where valet parking is available. I recall watching Buggs Bunny cartoons on Saturday mornings as a kid and that was the most exposure I had to classical music. I've often wondered how popular classical music would be if it weren't for Warner Bros. Would there be as many symphonic orchestras around the world as there are today? Would there be such a global appreciation for the genre? Fortunately, we'll never know. Classical music is the one genre that I enjoyed as a child and love as an adult. Was the evening's ASO serenade enough to lure me back? You better believe it! This world-class Orchestra is worthy of a lifetime of returns and curtain call after curtain call. I will give this destination a standing ovation every visit!